Most of my working life I have been a teacher. Even though I greatly value life experiences, I also am keenly aware of the benefits that a formal education can give. Because of that, when one of my students consistently slept in class this past year, I sat down to have a chat with her. It turned out she had a part-time job in a restaurant where she worked very late hours. She often got home at 3 or 4 in the morning, and then had to get up around 7 to get to her first class on time. I know the kind of pressure bosses here put on their employees, especially since they are usually short staffed. Even so, I told my student that the choice was hers: to put her efforts into work or into her studies. In the end, this young woman chose her job over her school work. She wrote the worst research paper of the entire class, even though her English abilities were some of the highest. I do not begrudge her her choice, but I do feel only she is responsible for the consequences of what she values. A second situation happened long before I came to Japan. When I was in my late twenties, I lived in Morocco. One vacation I chose to go by bus as far south as the road would take me. I went well beyond Marrakech, until I reached the outer fringes of the vast, unfathomable Sahara Desert. On that journey I met an older man who was making his annual trip home from France to see his two wives and many children. He told me there were no hotels in the teeny dusty village we both were heading to. But being steeped Arab hospitality, he offered to put me up. I had no choice, so accepted. It turned out he had one large square house with an open courtyard in the center. Half of the house was for his first wife and their twelve children; half was for his much younger wife and their one daughter. In fact, the man was in his last 60s and his newer wife was barely in her 20s. I stayed with her, even though all the kids, some older than she, enjoyed spending time with me, practicing French and telling me wonderful stories of their life in the village. One afternoon the very pretty second wife told me about herself. Her father had collected all his money to send her to Casablanca to go to school. While there she learned not only to read and write, but also about life in a big city. After she graduated, she went back to her village and was married off to the much older man her father had selected for her. He was an excellent catch because he had worked in France, so received a good pension. The father benefitted and his prestige soared. What, indeed, was the purpose of a formal education for this unhappily aware woman? The other day I volunteered at Imai Sensei’s Yomawari Group. I deeply respect Imai Sensei and admire the truly admirable work he does with many of the homeless folks here in Sendai. That particular day, there was a small seminar on health. The main topic was blood pressure. Of course, all the attendees got theirs measured. Not surprisingly, most, if not all, had high blood pressure. Then a nurse lectured about how to deal with that unhealthy situation. She started by talking about how baths were good for reducing stress. And then she went on to discuss diet; how lots of vegetables were good, and of course, low salt intake. She then moved onto exercise, like jogging. And finally said that if your blood pressure was dangerously high, you should surely see a doctor for treatment. As this nurse was giving her well-rehearsed speech, another volunteer, a foreigner, whispered to me, “What does this have to do with these people? They are living on the street? How can they get a bath? As for food, they eat whatever they can get; they don’t choose. Exercise? They spend all day walking, or night when it is cold. Seeing a doctor? Do they have health insurance that would cover the visits and pay for medication? 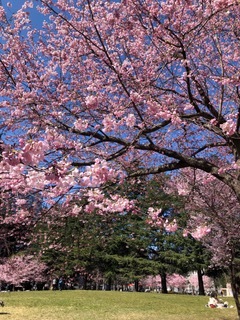 On my way home, I passed through a park filled with Sakura in glorious bloom. There were many people enjoying the gracious splendor. And sitting quietly on the edge of the green was a homeless man. He was gazing up at the delicate cherry blossoms, fully absorbed in their beauty. He was very relaxed, fully present, and keenly aware of the privilege of bearing witness to the ephemeral wonder of life.